Improves steering response by eliminating deflection allowed by the stock rubber rag joint. Reduces annoying play at the steering wheel. Stays secure because there are no setscrews to loosen. Improved header clearance at the lower U-joint. Precise fitment to your Mustang because its telescoping length accommodates different steering rack positions. Easier installation because it can be collapsed to a shorter length than stock, then extended to fit. Improved safety because it adds a collapsible section between the rack and the firewall. U-joints are welded to the shaft, no setscrews to loosen. Attaches to steering rack with a pinch-bolt clamp (just like OEM) instead of a setscrew. Two race-quality needle-bearing U-joints replace the rubber rag joint and the upper pin-and-block U-joint. Telescoping design allows lengthening, up to 1.1" longer than stock shaft, to allow repositioning of the steering rack. Unique design of the collapsible center section prevents the two halves from pulling apart. Collapses shorter than a stock shaft. For more technical information about steering shafts, click the button below. If you are installing an SN95 power steering rack in a Fox Mustang, you will need MM's Hybrid steering shaft (MMST-13). 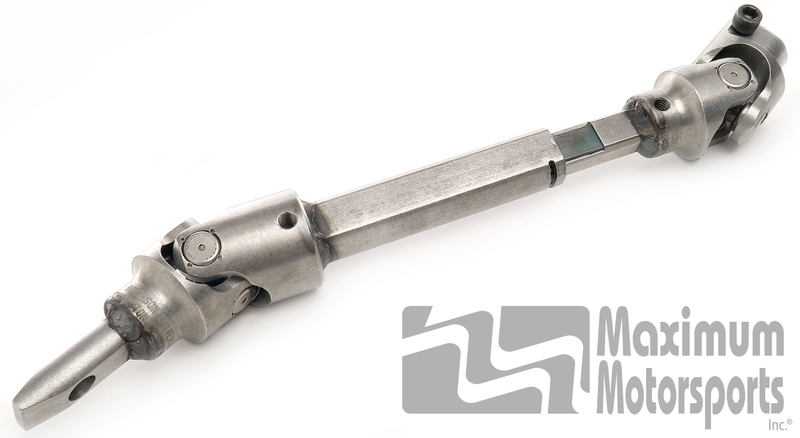 If you are installing a manual steering rack, you will need MM's Manual Steering Shaft (MMST-12.1).